Young, democratic and preaching peace, he's the leader the country has been waiting for. But can Abiy Ahmed live up to the hype? (CNN)At 6 am when Gutama Habro arrived at the Target Arena in Minneapolis, Minnesota, the line for tickets already snaked around the block. Within hours, 20,000 fans had packed the venue. "People around me were crying," says Gutama, a 28-year-old medical laboratory scientist. "Seeing this was a dream come true." Gutama wasn't at a pop concert. This was the final leg of Ethiopian Prime Minister Abiy Ahmed's three-city American tour. Held in July, it was the first time the 42-year-old had visited the more than 251,000 Ethiopians living in the United States, many in self-imposed exile -- fleeing ethnic clashes, violence, and political instability in their homeland. "The level of hope was something we had not seen since the election of Barack Obama," says Mohammed Ademo, an activist who fled to the US in 2002 and founded OPride.com, a news outlet that was blocked for years at home. Since taking office on April 2, Africa's youngest head of government has electrified Ethiopia with a dizzying array of liberal reforms credited by many with saving the country from civil war. Abiy has freed thousands of political prisoners, unblocked hundreds of censored websites, ended the 20-year state of war with Eritrea, lifted a state of emergency, and planned to open key economic sectors to private investors, including the state-owned Ethiopian Airlines. 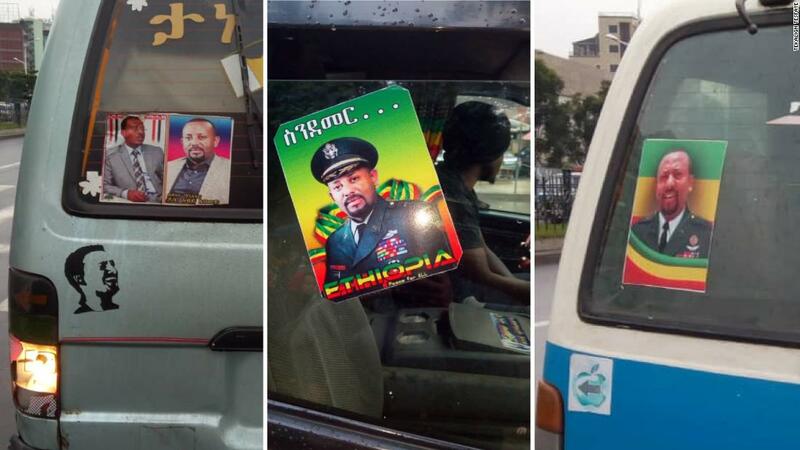 In the capital city of Addis Ababa, taxi windscreens are plastered with Abiy stickers, while citizens are changing their Whatsapp and Facebook profile pictures to pro-Abiy slogans and spending their money on Abiy T-shirts. Elias Tesfaye, a garment factory owner, says that in the past six weeks he has sold 20,000 T-shirts bearing Abiy's face, which cost about 300 birr ($10) each. In June, an estimated four million people attended a rally Abiy gave in the capital's Meskel Square. Tom Gardner, a British journalist who lives in Addis Ababa, says there is an almost religious fervor to what has been dubbed "Abiymania." "People talk quite openly about seeing him as the son of God or a prophet," he says. A prime minister's wardrobe doesn't often attract attention. 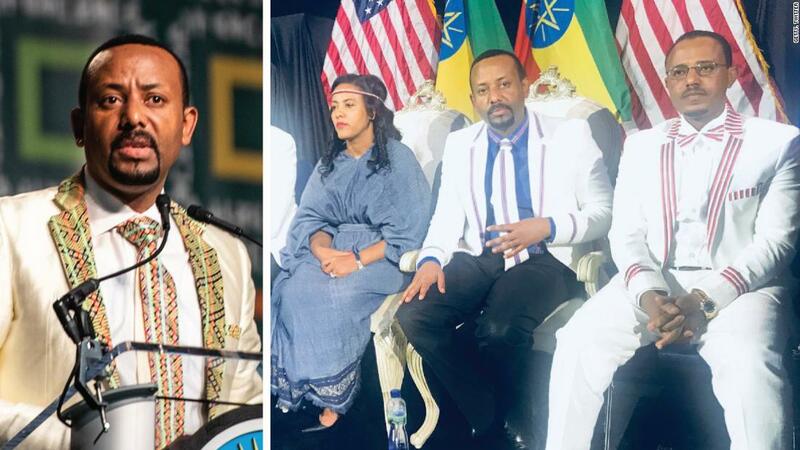 But the blazers with purple or green and gold trim that Abiy wore on his US tour were not just a natty pick: this was traditional Oromo attire. Left, Abiy Ahmed in Washington and, right, with his family in Minnesota on his US tour in July 2018. That's significant. Abiy is Ethiopia's first prime mister from the country's biggest ethnic group, the Oromo, who make up one third of its 100 million people. Ethiopia has more than 90 ethnic groups, and for decades the country's politics have been organized along these divisive lines. In 1991, the Tigrayan People's Liberation Front (TPLF) toppled the dictatorship of Mengistu Haile Mariam, whose communist regime had imposed military rule since 1974. Mengistu had thousands of his political opponents murdered and ignored a famine that killed one million people -- a tragedy that found a global spotlight in the 1984 Band Aid charity record "Feed The World."